The health care community is trying to tend to its own. Newly appointed chief wellness officers are helping make physician well-being a priority. 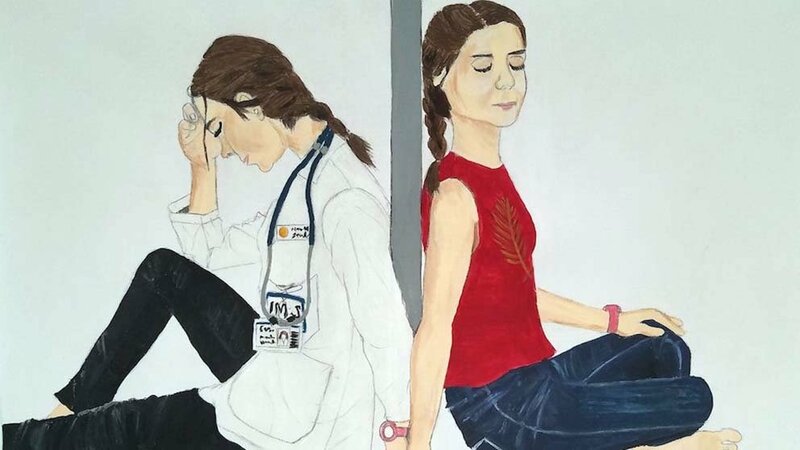 This painting is part of an art exhibit curated by the National Academy of Medicine called Expressions of Clinical Well-Being. The painting was created by Nicole Hawkins, a student at Eastern Virginia Medical School, and is titled Self-Preservation. It’s no secret that physicians are hurting: 54% of doctors report symptoms of burnout; 39% are depressed; and as many as 400 commit suicide every year, a rate that is twice as high as other professionals (and higher even than the military). Hospitals and health systems face $17 billion in annual turnover costs related to burnout, according to a May 2018 report. Fueled by positive results from pioneers, including Bernadette M. Melnyk, PhD, RN, named Ohio State University’s chief wellness officer (CWO) in 2011, and Tait Shanafelt, MD, who has done extensive research on physician burnout and was named Stanford Medicine’s first CWO last year, the National Academy of Medicine (NAM) is exploring possible recommendations for how health systems can promote well-being, which could include hiring CWOs. Currently, AAMC president and CEO Darrell G. Kirch, MD, and other participants in NAM’s Action Collaborative on Clinician Well-Being and Resilience are developing a commentary that calls on health systems to consider hiring CWOs. In addition, the collaborative is working with more than 180 health care organizations around the country to raise visibility about clinician burnout. These moves could not come soon enough. Research published in July 2018 in Mayo Clinic Proceedings found that burned-out doctors are twice as likely to report major medical errors as their healthier peers. And a study from Ohio State University found that nurses in poorer emotional health are between 26% and 71% more likely to make medical mistakes. “We are at an inflection point,” says Jonathan Ripp, MD, recently tapped for the chief wellness officer role at the Icahn School of Medicine. “We know we need to tackle the root causes” of physician stress and burnout. That includes exploring those elements of distress that most contribute to burnout, such as poor work-life integration, inefficient use of or lack of resources, and fatigue, all of which lead to an erosion of meaning from work. And it means shifting the burden of responsibility to enact change away from overburdened providers. In many ways, burnout itself isn’t the problem. It’s just one symptom of the current status quo — an off-kilter universe where doctors typically spend just 27% of their time with patients and almost 50% on electronic health records (EHRs), documentation, and other administrative duties. That’s translated into an average 86 minutes per day of dreaded “pajama time,” tedious but necessary work that follows doctors home each evening. Many practice environments “make it difficult for doctors to do the right thing,” adds Shanafelt. “When it takes 20 clicks to order a flu shot, it’s not just that it is an inefficient use of the doctor’s time. It is the system putting in a barrier to what the patient needs. Inefficiency, an excessive amount of low-value work, and the feeling the system is working against them rather than supporting them, is demoralizing. Part of the chief wellness officer’s job, then, is to identify problems within their specific environments that contribute to burnout – and then work toward solutions. At Stanford, Shanafelt’s work includes improving the efficiency of the practice environment, promoting teamwork and community, encouraging approaches to leadership that breed engagement, cultivating compassion for self and colleagues, and providing support to physicians experiencing distress. Efficiency and simplifying workplace systems are also priorities. He’s confident these changes can pay off: When he was at Mayo, these interventions helped decrease burnout rates by 7% in a two-year period, at a time when national levels rose 11%. Ripp says it’s also essential to encourage doctors to do the work they find most meaningful, whether that’s academic research, more time with patients, or mentoring. One study found that when doctors were given the opportunity to spend one day a week on the aspect of work they felt mattered most, burnout rates fell from 54% to 30%. Leadership training is also a priority, as these wellness officers discover just how toxic a bad boss can be. And they’re paying close attention to newer doctors. “People often think of burnout as a late-career phenomena,” says Shanafelt, “but extensive research both inside and outside of medicine indicates it’s more common in younger people.” Multiple studies also indicate an increased risk in women, who are more likely to be in two-career relationships, have young kids, and greater personal life responsibilities. David Rogers, MD, Jonathan Ripp, MD, and Tait Shanafelt, MD, will share their experiences in developing and implementing system-wide interventions to promote physician well-being during a Learn Serve Lead 2018 session on Saturday, November 3, 2018. The best case for change ultimately may come from the bottom line. “Multiple studies have shown that, for every dollar invested in wellness, there is a $3 to $4 return,” says Melnyk, who also is dean of OSU’s nursing school. OSU’s strategies, such as holding walking meetings instead of seated ones and offering personal finance resources for health care professionals who are stressed about loan debt, have shown improvements in health outcomes for employees, including clinicians at its seven hospitals. “Happy, healthy clinicians are more engaged, deliver a higher quality of care, and make fewer errors,” Melnyk says.